Stage II All-Ukrainian Student Olympiad in the discipline "Pharmacology"
In accordance with the Order of the Ministry of Education and Science of Ukraine No. 1313 of 11/28/2018, the “On the All-Ukrainian Student Olympiad in the 2018/2019 academic year” and the letter of the Institute for the Modernization of Education No. 22.1 / 10-4525 of 05.12.2018. National University of Pharmacy The is designated as the base institution of higher education for conducting Stage II All-Ukrainian Student Olympiad in the discipline "Pharmacology" for medical, classical universities and medical institutes, which will be held April 17-19, 2019. Registration of participants of the Olympiad will be held April 17, 2019 from 10 am to 11 am in the medical and biological building of the National University of Pharmacy at the address: Kulikovskaya str., 12, Department of Pharmacology. 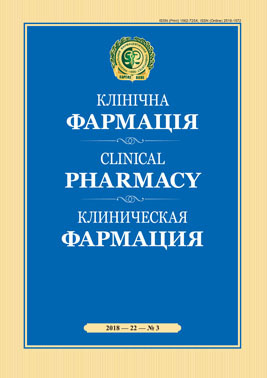 Twenty years have passed since we had the first issue of a new scientific and practical journal «Clinical Pharmacy» with the hope in our hearts. And it should be noted that our hope was justified. Over the past time, the journal «Clinical Pharmacy» has won a worthy place among the leading medical and pharmaceutical publications not only in Ukraine but also in the world.